Known also as black walnut, Juglans Nigra is a hardwood tree. Its natural habitat is North America and some European countries. The hull of the black walnut contains juglone, tannins and iodine. Juglone’s toxicity to a great number of other plant species makes it a powerful defender of the black walnut tree. It’s thought that the juglone is effective against harmful organisms. Plants produce natural compounds called tannins. These tannins help plants to defend themselves against harmful insects and other organisms. Our Black Walnut capsules are now equivalent to 2000mg dried hulls – strongest capsules on the market. Lemon Balm, also known as Melissa, is a herb used since ancient times. Usually it is associated with relaxation however it offers far more benefits. The main active ingredients in lemon balm are rosemarinic acid, eugenol, tannins, terpenes and a host of aromatic acids. Each capsule provides 450mg of this beneficial herb. Lemon Balm is often used with Motherwort for their synergistic effects. 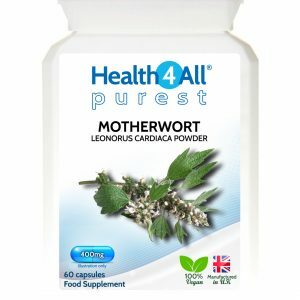 Motherwort herb, Leonurus Cardiaca (Latin: lion’s heart) has long-standing reputation as cardiovascular and nervine tonic. The main active compounds in Motherwort are flavonoids (notably hyperoside), terpenes, phenolic acids, volatile oils, sterols, tannins and alkaloids (notably mild vasolidator lenourine). Each capsule provides pure Motherwort herb standardised to 0.6% hyperoside. Motherwort is often used together with Lemon Balm for their synergistic effects. The raspberry, known otherwise as Rubus Idaeus, is a soft fruit that grows throughout North America and Europe. Leaves of raspberry have been used for centuries. The prime constituents of raspberry leaves are such antioxidant polyphenols as tannins and flavonoids (notably quercetin and kaempferol) and phenolic acids. Each capsule provides 430mg of pure raspberry leaf herb. Vitamin K is a fat soluble vitamin that naturally occurs in 2 forms: K1 (phylloquinone) which regulates blood clotting and K2 (menaquinone) which regulates calcium deposition. Vitamin K2 activates the calcium-binding actions of two proteins – matrix GLA protein and osteocalcin, which help to build and maintain bones and teeth. By helping with calcium metabolism it prevents calcium building up in the wrong locations, notably the calcification of arteries. Low intake of vitamin K2 is associated with plaque building in the arteries, tartar forming on the teeth, and hardening of tissues that causes reduced flexibility, stiffness and pain. K2 MK-7 is the most absorbable form of vitamin K2. It’s 100% plant-based – derived from natto fermentation. DHA (Docosahexaenoic acid), a long chain polyunsaturated omega-3 fatty acid, is a major structural fat found in the brain and eye accounting for up to 97% of the total omega-3 fats in the brain and up to 93% of the omega-3 fats in eye retina. It is also a key structural component of the heart tissue and cardiovascular system. 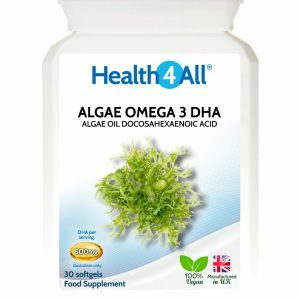 Algae are natural sources of DHA and the reason why fish are rich in omega-3: because of strong presence of algae in their food chain. It is therefore reasonable to reach to the very source of this important nutrient without impacting the ocean eco-systems. Each vegan softgel provides 250mg DHA – a daily amount recommended by EFSA for maintenance of normal brain function, vision and heart health. Ascorbic acid, more commonly known as vitamin C, is a water-soluble vitamin. Although many animals are able to make vitamin C in their own bodies we humans can’t do that – we must get it through our diets. Vitamin C contributes to normal collagen formation for the normal function of blood vessels, bones, cartilage, gums, skin and teeth. As a strong antioxidant, it contributes to the protection of cells from oxidative stress. It contributes to: normal energy-yielding metabolism, normal functioning of the nervous system, normal psychological function, normal function of the immune system, reduction of tiredness and fatigue, regeneration of the reduced form of vitamin E and increases iron absorption. Our 1000mg capsules contain pure ascorbic acid without any additives. Immune support tablets for children 4+ consisting of Vitamin C, Zinc and Copper in ideal proportions. To maximise health benefits of the formula, Zinc and Copper minerals were added in non-chelated versions. Vitamin C, Copper and Zinc contribute to the normal function of the immune system, nervous system and to the protection of cells from oxidative stress. Sweetened with sorbitol and fructose and flavoured with natural orange flavour these tablets are 100% vegan. Vitamin B12 is necessary to the normal function of the immune system, nervous system and normal psychological function, red blood cell formation, energy-yielding metabolism and to the reduction of tiredness and fatigue. Recommended for children on restricted diets low in vitamin B12. Each tablet provides 2.5µg (100% NRV) of vitamin B12 in methylated version: Methylcobalamin. Sweetened with sorbitol and sucralose and flavoured with natural orange flavour these tablets are 100% vegan and sugar free. German Chamomile is one of the most ancient herbs known to mankind. It is usually associated with relaxation and digestive health. The main active ingredients in chamomile are terpene bisabolol, flavanoids (notably apigenin and quercetin), coumarins, terpenoids and flavonoid glucosides. Each capsule provides 375mg of this beneficial herb. Chamomile is often combined with Lemon Balm for their synergistic action. The plants are cultivated using strict organic farming practices on the farms of South East of England. Powdered hemp is standardised to contain 2% cannabidiol and 0% THC. Capsules are non-GMO, 100% Vegan and free from synthetic cannabinoids. 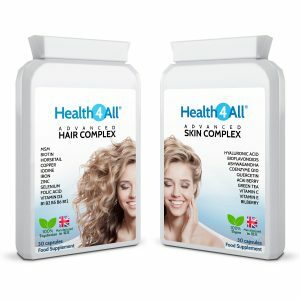 Advanced Hair and Skin Complex Capsules – 2 x 30 Capsules Set. Designed to provide nutrients for strong hair and healthy glowing skin. Formulation consist of vitamins and minerals enriched with MSM, Horsetail, Coenzyme Q10, Hyaluronic Acid, Acai Berry, Bilberry, Green Tea, Ashwagandha, Citrus Bioflavonoids and Quercetin.